It’s not been smooth sailing for Hailey Upton (Tracy Spiridakos), Intelligence’s newest member. First, Chicago P.D. 's youngest detective replaced the popular Erin Lindsay (Sophia Bush), who quit the unit. And now, she’s secretly dating Adam Ruzek (Patrick John Flueger) the former fiancé of another beloved female colleague, Kim Burgess (Marina Squerciati). 'She's not a bad person, but very determined,' says the actress. That situation could break open in this week’s episode, "Ties that Bind," when the unit heads to Wisconsin to take down a syndicate of illegal gun sellers and Upton and Burgess go undercover together. Spiridakos gives evidence to TV Insider about what to expect on "Ties," Upton’s romance with Ruzek, and on-set revenge. P.D. fans feel strongly about the Upton-Ruzek romance — they either really love it or really hate it. What is it about "Upzek"? Tracy Spiridakos: Its very... interesting. The reaction is probably because the whole thing kind of came out of nowhere. I think some people just weren’t ready for it. A lot of fans thought maybe Hailey would go with somebody else [her partner Jay Halstead, played by Jesse Lee Soffer] and so, there’s a bit of that. Maybe they think you’re a fiancé stealer? Maybe, but they were kind of broken up before Hailey was in the picture. Burzek fans are very intense and love that pairing together. I think it definitely throws them for a bit of a spin when they see Ruzek with someone else. Does Upton feel guilty about secretly dating Ruzek? I think that Upton feels likes she should have had a conversation with Burgess earlier about it. We find out more as to why she didn’t in this episode. For one thing, she didn’t expect anything to happen with Ruzek. She also showed some vulnerability with her partner and good friend Halstead when he discovered what was happening between Ruzek and Upton and she hadn't confided in him. Halstead and Upton are really close and they go to each other for anything, so this was a big secret she kept from him. The guilt of that was weighing on her. It seems to me that Halstead is the person she’s closest to. They’ve been through so much together on the job. Uh oh! Does that mean something for Halstead and Upton? No! That’s not me foreshadowing. We break down what's next for these characters. How serious will Upzek get? I’m not sure. Ruzek’s taking the fall when Antonio Dawson (Jon Seda) [accidentally killed a suspected murderer] and getting in jeopardy changed her perspective. And she got emotionally involved, surprising herself. She wants to help him any way that she can. Are you enjoying the relationship? Yes! It’s an interesting dynamic; they are so different from one another. Upton is very intense and that throws Ruzek a little bit. Paddy is one of the most lovely people ever. We tease each other a lot. He said something to me one day so I took a banana and mushed it up, wrote ‘Don’t mess with me' on it, threw it in the bottom of his backpack and waited for him to find it. [Laughs] I ended up feeling guilty and texted him about what I did, just when he found it. He’s like an older brother, which is hilarious because of the storyline. Marina’s hysterical by the way; she makes me laugh a lot. The two cops won’t have much to laugh at in "Ties That Bind" will they? Right before the unit goes to the gun show to take down the manufacturer of cop-killer machine guns, Burgess finds out about Upton and Ruzek. She’s not super happy about it, but they’ll be together in a threatening situation and they have to work together. Marina and I got to work together for many days in a row, which we rarely get to do. Burgess and Upton are undercover together, an arena that Upton has a lot more experience with. Will Burgess have to follow her lead, though she’s not feeling kindly toward her? Hailey does have more experience, but they really need each other to get out of the situation they find themselves in. You play a kickass character in Chicago P.D. as you did in Revolution and MacGyver. Are you in constant training, or does action come naturally to you? Do you like doing it? Thank you! I do. I have two older brothers, and I’ve always really been into martial arts and training myself. I’m just fascinated by it. I used to take kickboxing. And then I studied Krav Maga [Israeli-created self-defense training] and Shotokan [a form of karate]. I do as much of action as they allow me, but we have great stunt doubles who make us look really badass. Give us some hints about what else is coming up. 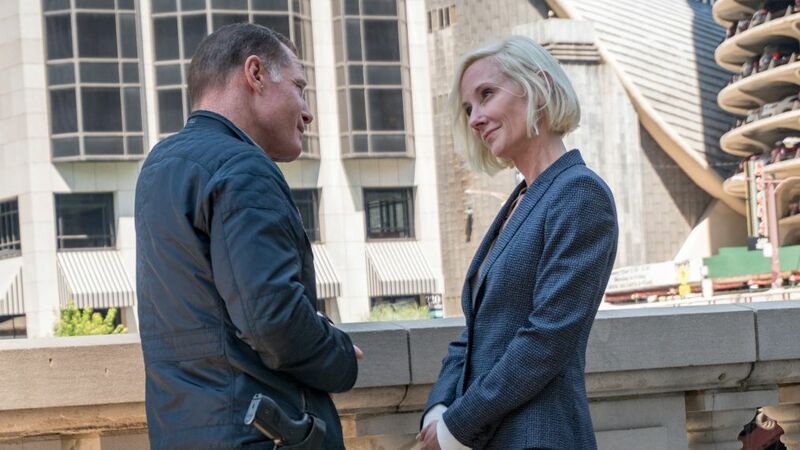 I don't know much, but there’s a P.D.-Fire crossover coming [on Wednesday, February 20]. It’s the first time I worked over at the Fire stages with their cast. It was really exciting and I had a great time.